This Halloween, don’t just watch your favorite monsters in movies, eat like them! Here, 15 recipes inspired by Dracula, the Wolf Man, Frankenstein’s Monster and more. This vibrantly red cocktail is bitter and sweet, thanks to a splash of Aperol with the blood orange juice and vodka. This blood-red borscht is packed with beets, onions and cabbage. Stunning yet simple, this crostata is nothing but sweet-tart oranges and bit of sugar on a flaky, buttery crust. Fresh muddled rosemary is fantastic in this version of the gin-and–grapefruit juice classic. For their unconventional tartare, Rich Torrisi and Mario Carbone quickly sear beef before finely chopping it. Moon pies are classic Southern cookies filled with marshmallow and coated with chocolate. In this version, crispy sugar cookies are spread with chocolate and peanut butter, then sandwiched around a marshmallow filling. This version of the classic pre-Prohibition drink substitutes Armagnac for the usual brandy and Calvados for applejack. Frankenstein’s Monster wasn’t a big fan of fire, so this recipe requires a minimal amount of cooking. A blender makes quick work of this clever harissa sauce. These monster cookies are packed full of goodness—peanut butter, chocolate, oatmeal and butterscotch. This red-hued cocktail is made with Scotch, sweet vermouth, cherry liqueur and fresh orange juice. This fun, highbrow take on pigs in a blanket swaps spicy andouille sausage for hot dogs. These cookies are unbelievably light, delicate and crisp. Tart and tropical, this cocktail is made with rum, fresh lime juice, triple sec and blue-tinted Hpnotiq. 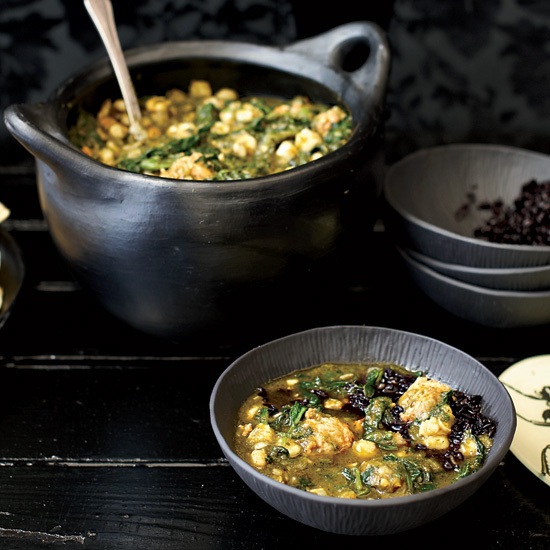 Spinach and pureed poblano chiles give this chili a swamp-like look. In these single-serving desserts, rich and creamy cheesecakes are baked atop a chocolate-wafer base.